If your boys are anything like mine, and love Minecraft, you probably see their eyes light up when they see a Minecraft graphic tee in the store. I am not a huge fan of Minecraft apparel, however, the boys and I have found a happy balance to the amount of Minecraft they wear. After all, I can’t control everything they wear, and have to let them be themselves. Here is an example of how you can create a Minecraft inspired look and still be fashionable. We call it “The Creeper”. A green and black look that it totally Minecraft. By wearing a button down shirt over a graphic tee and neutral black shoes, the pop of green of the skinny jeans isn’t too overpowering. The socks may scream Minecraft, but are hidden under the pants. Now you have a fun Minecraft look that any Minecraft fan would love to rock. 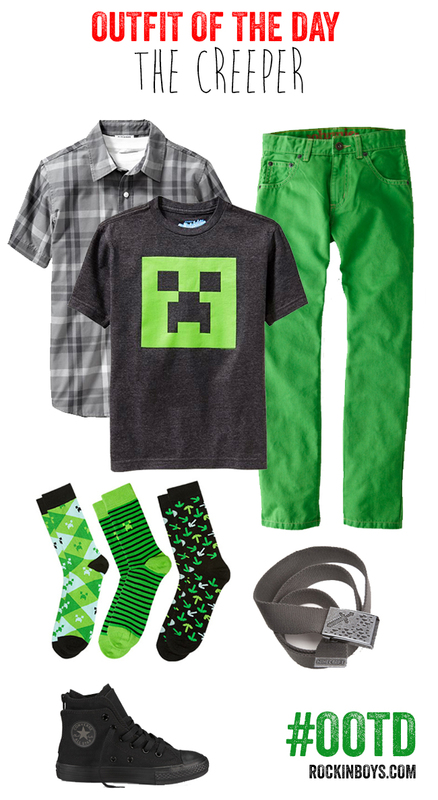 Creeper Minecraft Tee// By Old Navy. Available online and in-store. Plaid Short Sleeved Shirt//By Old Navy. Available in sizes 4-16, online and in-stores. johnnie B Slim Jeans//By Boden. Available in green, turquoise and multi. Chuck Taylor Zip Back Hi-Tops//By Converse. We love how kids can just use the zipper on the back. No lace tying necessary. Minecraft Ironsword Belt//By Jinx. Available in S/M & L/XL. Minecraft Socks//By Jinx. Pack comes with three different patterns. Available in S/M/L.